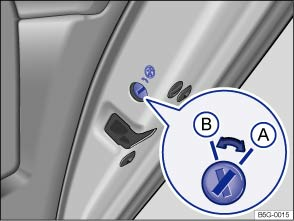 The childproof lock prevents the rear doors from being opened from the inside, e.g. so that children cannot open the doors accidentally while the vehicle is in motion. When the childproof lock is activated the door can only be opened from the outside. Unlock the vehicle and open the appropriate rear door. Fold the key bit out of the vehicle key. 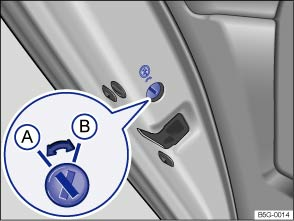 Use the key bit to turn the slot to the required position. Childproof lock is switched off. Childproof lock is switched on. When the childproof lock is activated, the door cannot be opened from the inside. Never leave children or people requiring assistance alone in the vehicle when the doors are locked. This may mean that these people lock themselves in the vehicle. They could become trapped in the vehicle in an emergency and may not be able to get themselves to safety. People locked in the vehicle may be subjected to very high or very low temperatures.